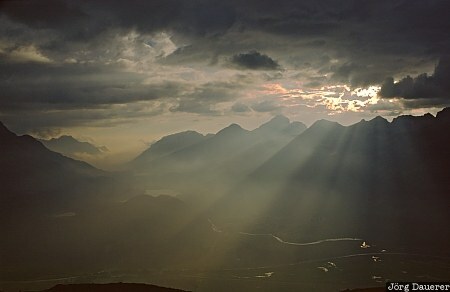 Sun beams illuminating the spectacular landscape of Oberengadin seen from the viewpoint Muottas Muragl. The Oberengadin valley is in Kanton Graubünden in southern Switzerland. This photo was taken before sunset on a sunny day in September of 1999. This photo is part of the exhibition Sun Beams (October 2011).